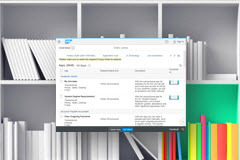 3 What is the Fiori Apps Library? I am a seasoned Presales professional with 23+ years of experience helping customers understand the value of technology for their organization as part of their digital transformation. I engage with and help customers across all aspects of Presales activities including business problem discovery and clarification, business value extraction and mapping, solution modeling and architecture, presentations, demonstrations, prototypes/proof of concepts, and much more. Since 1995, I have sold and supported a wide variety of enterprise solutions including Platform, Cloud, Integration, Security, ERP, Development, and Change Management solutions and services. I actively work with emerging technologies such as SAP Leonardo, Blockchain, voice-enabled user experiences (eg Alexa) and more. My goal is to make technology understandable and accessible to anyone and everyone. I have a passion for enterprise platform solutions & technologies and all things Presales.